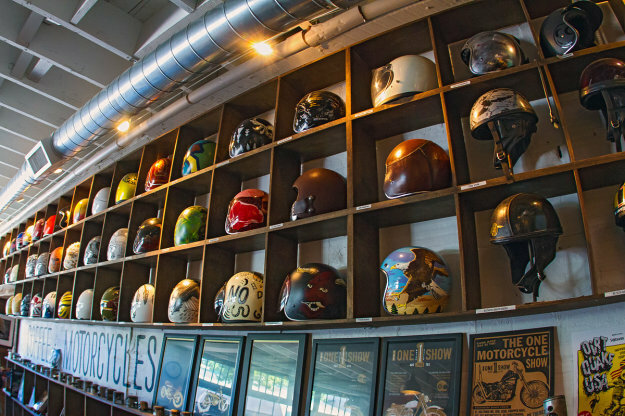 If the name sounds familiar, that’s probably because Thor runs The One Motorcycle Show and organizes the 21 Helmets exhibition, both regular fixtures on the US custom calendar. But most days you’ll find Thor at his See See Motor Coffee Co. establishment, which is the kind of business we’d all like to run. 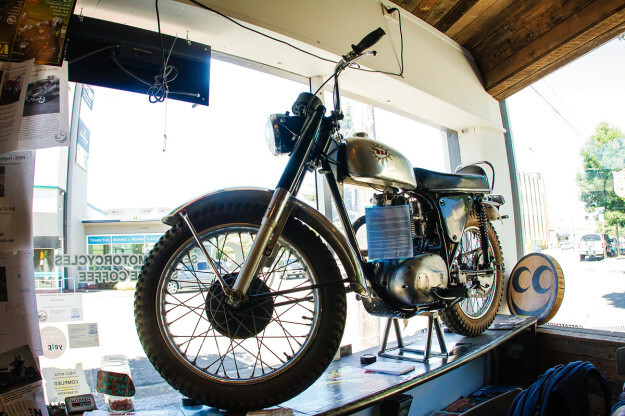 It’s essentially a motorcycle café that also sells cool gear, books and magazines—and has a couple of workshops tucked away at the back. When did you start See See? We’ve been in action for seven years. I started it with Drake McElroy and a loose idea: that a dirt bike would be a good platform for a café-styled bike. We grew up playing in the dirt, and wanted something fresh and new to work on. So Drake built a YZF450 and I built an XR400. We built bikes that looked good and performed well, with some classic design cues. Where did that logo come from? I had a strange dream about the logo, and built a name and brand around it. The logo was a hat tip to the fact that motorcycles make me very happy. A lot of stuff at the time was all about skulls and being ultra tough: we just wanted to make something different. 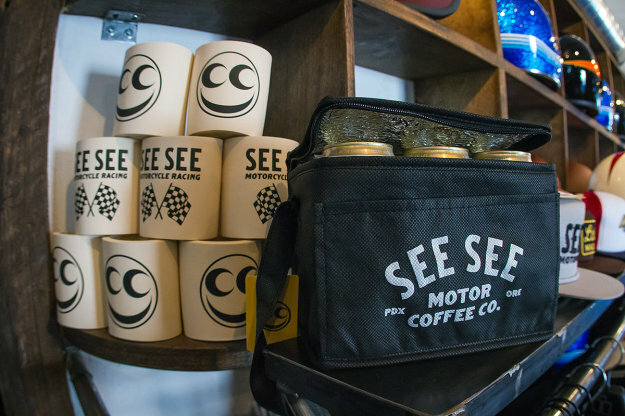 We came up with the See See name to be less motorcycle-centric, but it also refers to the style of bikes we like: metric or “cc” bikes. The “See See” also comes from the eyes on the logo. When did you open the store? On 10 June, 2010. It was a small shop on the industrial north side of Portland. 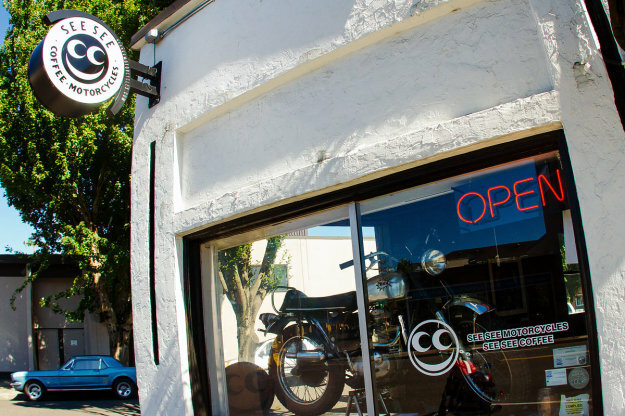 We were one of the first Poler Stuff and Biltwell dealers. How did you pick your location? Our location found us—we don’t have deep pockets, and that was a huge factor. We’ve now moved to central Portland, on one of the main roads. But we’re pretty isolated as far as businesses go, there’s not much around us. My partner George Kassapakis assured me it would be a good spot, but I didn’t see it at first. But after we gutted the building I saw huge potential. It was four months of 12-hour days just getting the coffee side open. What’s it like inside? When you walk in the door you will notice 130-year-old barn wood. The front of the coffee bar is sheet metal I used in my last workshop as flooring. The whole back wall is stuff I pulled down during the renovation. The uprights on the bar are old frames, and I even used my old coin collection for covering ugly hardware. George and I built the whole place, and I’m damn proud of that. What do you sell? Premium Stumptown coffee, breakfast pastries by Roman Candle Bakery, sandwiches made in-house, and other tasty treats. We have hot dogs for lunch, and they are damn good. Some say the best. We have a couple of craft beers, wine and domestic lagers too (like Rainier Beer). We also sell motorcycle parts, helmets, jackets, safety gear and lifestyle clothing. 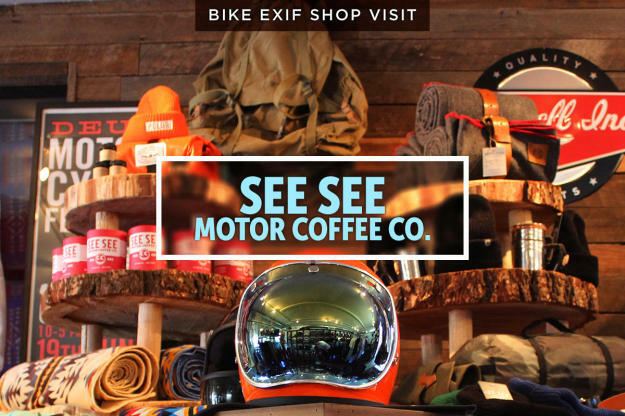 It’s a curated mix of big and small brands—such as Icon, Bell, Biltwell, Brixton and Danner. 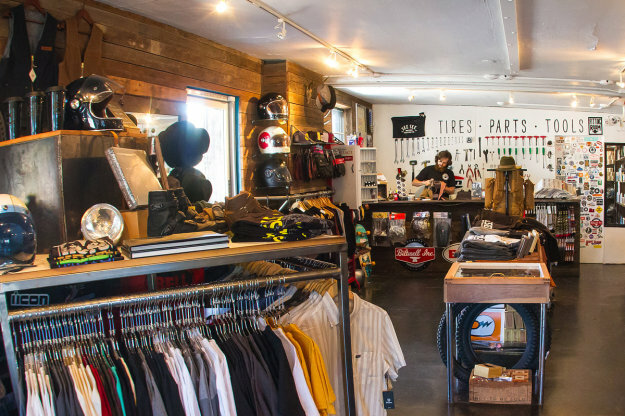 Plus Chrome bags, Electric Sunglasses, and stuff from Loser Machine and Busch Bros. And even Deus ex Machina. We have an expanding in-house line of See See gear too, and make a few parts of our own—like mini switches. What are the workshops like? One side is a tiny machine bay, and the other is for tuning and assembly. We don’t mess around with any maintenance, with the exception of our own bikes. We do about four customer bikes a year. 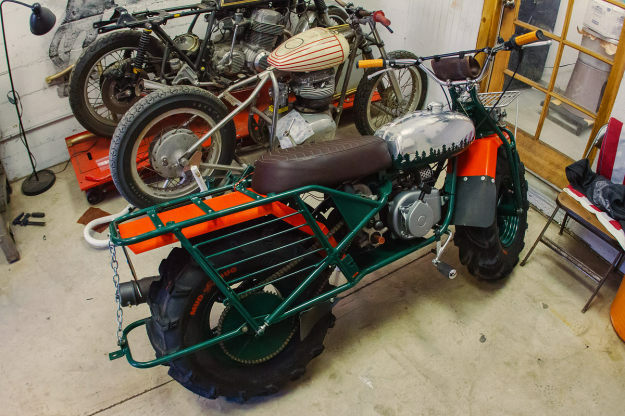 We always try to build motorcycles that are fun and different. We just did a custom Rokon for Danner Boots—I was real excited to do that one. Somehow we’ve got labelled as café-style builders, but we have only done a few. And even those are pretty different from the standard café style. You sound busy. It’s a careful balance. You need to make it worth your time, but you don’t want it to be too much like work. You see a lot of builders get burnt out by trying to make motorcycle building their main business. It can turn from a hobby to a poorly paying job pretty quick. Someday I want to be old and still excited to build motorcycles. I don’t get to spend as much time as I would like in the shop itself. I think about it all day long, but business work (i.e., emailing) takes up most of my time. Has See See lived up to your expectations? We are still open. I think that deserves a high five! But it’s been mountains of work. Running a small business in the USA can be tricky. It requires a ton of balance between work and pleasure, and most of the time the lines are blurry. I would say 70 percent of the time I’m doing work that’s just like any industry, across the board. If you want to own something nice, you have to clean it and take care of it—and that’s not glamorous work. But I wanted to add to the motorcycle scene, something I enjoyed. 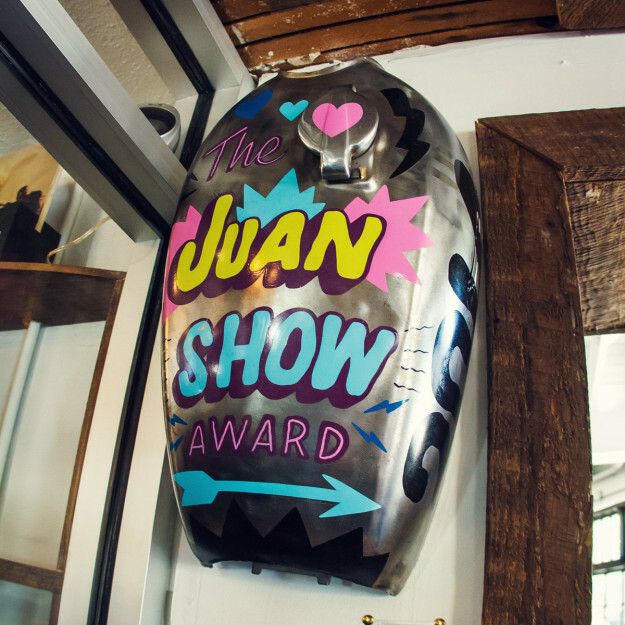 Growing up as a skate rat in skateboard shops, you learn to foster your community. I’ve always wanted to be inclusive and open, showing people like myself a little knowledge and acceptance. But, as you know, the motorcycle world is pretty quick to judge, classify and discriminate. I never understood this. What kind of people visit See See? This is the best thing—we have no specific type of customer. If I had to categorize them at all, I would say they are all nice people. We get a lot of young families, older enthusiasts, and lots travellers who stop in on their trips. On the motorcycle side we get it all as well. We love all types of motorcycles, so we cater to all types of bikes. 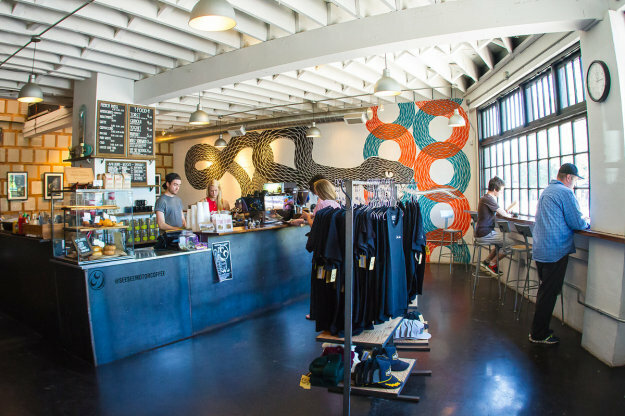 What’s it like being based in the hipster capital of the world? 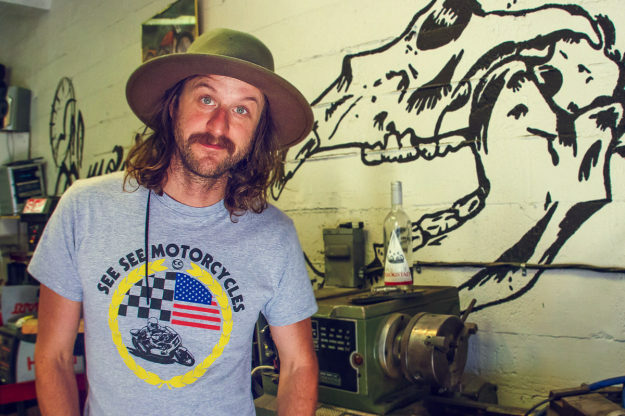 Well, if you like motorcycles, good food and the wilderness, and you don’t have millions of dollars, Portland is a pretty damn good place to live. I lived here before the word “hipster” was the common name for young people. The word is too broad for my taste—I don’t even know what it means. Maybe it’s someone born between 1975 and 1987? Or is it a haircut? I have heard a lot of talk about skinny jeans, but punks wear the same style. So do cowboys for that matter. What bikes do you ride yourself? Oh boy! Dirt: ’14 KTM 500 XC-W, ’75 Husky CR250 and a ’86 Honda CR250. 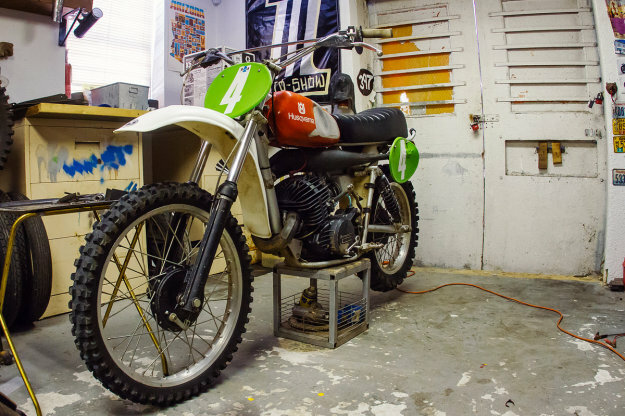 Flat track: ’78 Trackmaster Yamaha TT500, and a ’74 Framer Yamaha MX250. Street: ’74 Cone shovel FLH Harley Davidson, ’10 Triumph Scrambler 900, ‘79 SR500 (owned since I was 17 years old), and a ’99 Ducati Monster 750. We’ll come and visit. When are you open? We’re open seven days a week. Sometimes we have night events. I love having night events.